Thus could the Ali Jihad Racy Ensemble's joyful, lyrical, rhythmically percolating set of medleys of Arabic music at the beginning of the evening form an arch nearly four hours later with David Philipson's peaceful, soulful North Indian improvisations on a bansuri (a bamboo alto flute) over a tanpura drone at the end. Philipson keeps you riveted with melodic lines that weave and flow, singing the tune of the traveller. 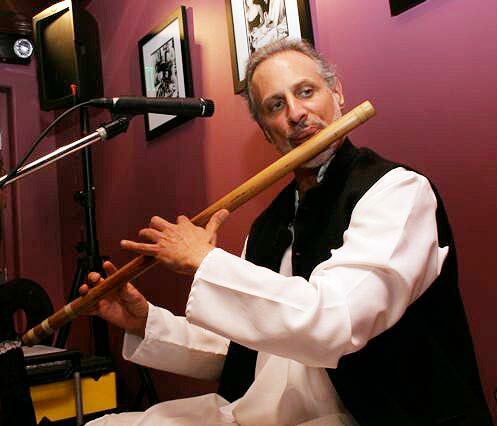 On bansuri (the north Indian flute) is David Philipson, the West's foremost exponent of this ancient instrument. Philipson brings the clear call of nature into the din with elegantly bent excursions on his bansuri. David Philipson gave ample evidence by his prowess that the bansuri as an instrument is not foreign to his musical intuition or alien to the western culture. The bansuri, an instrument invented for the ragas of North Indian classical music, has a haunting, affecting quality, and Philipson stretches the boundaries of that folk instrument on his improvisations. 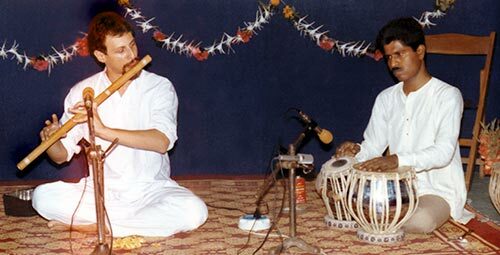 David Philipson from the U.S. was on the bansuri. The efforts to understand and put across the spirit of Indian classical music was evident in his playing. The warm timbre of Philipson's traditional flute is especially enticing. Garland Wright is very ably assisted by the musicians, David Philipson and Leonice Shinneman, who give this economy its force and the movements their grace. Musicians David Philipson and Leonice Shinneman use Indian instruments with delicate effectiveness. 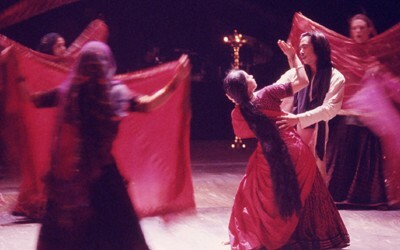 The sound effects and live Indian music provided by David Philipson and Leonice Shinneman is sometimes haunting, sometimes jubilant, and sometimes very funny, as the mood dictates. The production is enhanced by live musicians David Philipson and Leonice Shinneman. Listen to the music for Naga Mandala here.